Progressive Supranuclear Palsy (PSP) is an aggressive, deadly neurodegenerative disorder for which there is currently no effective treatment or cure. As a pure tauopathy and orphan disease, it has attracted industry attention as a promising market opportunity and important steppingstone to new therapies for Alzheimer’s, chronic traumatic encephalopathy, and frontotemporal dementia. 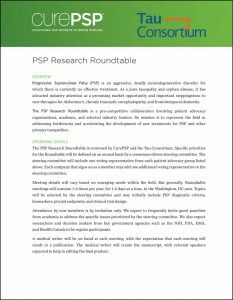 The PSP Research Roundtable is a pre-competitive collaboration involving patient advocacy organizations, academia, and selected industry leaders. 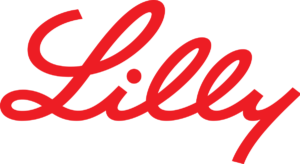 Its mission is to represent the field in addressing bottlenecks and accelerating the development of new treatments for PSP and other primary tauopathies. The PSP Research Roundtable is convened by CurePSP and the Tau Consortium. Specific priorities for the Roundtable will be defined on an annual basis by a consensus-driven steering committee. The steering committee will include one voting representative from CurePSP, the Tau Consortium, and Dr. Adam Boxer. Each company that joins may add one additional voting representative to the steering committee. Meeting agendas will vary based on emerging needs within the field. But generally, Roundtable meetings will convene 1-2 times per year, for 1-2 days at a time, in the Washington, DC area. Topics will be selected by the steering committee and may initially include PSP diagnostic criteria, biomarkers, pivotal endpoints, and clinical trial design. Attendance by non-members is by invitation only. Guest panelists from academia will be included addressing the specific issues prioritized by the steering committee. Researchers and decision makers from key government agencies such as the NIH, FDA, EMA, and Health Canada will also participate. A medical writer will be on hand at each meeting, with the expectation that each meeting will result in a publication. The medical writer will create a manuscript, with speakers weighing in with editing the final product. The outcomes of the PSP Research Roundtable are expected to facilitate clinical trials in PSP and to develop new guidelines for outcome measures that are meaningful and acceptable for the regulatory bodies. Membership in the PSP Research Roundtable is open to leaders in the pharmaceutical, imaging, and diagnostics industry who are interested in advancing the science of PSP and related tauopathies. The annual membership fee is $50,000 per company. Each member company may appoint one representative to the steering committee and send up to four representatives to each Roundtable meeting. Membership fees cover meeting registration but do not cover out of pocket travel expenses. Please click on image below to download PSP Research Roundtable flyer.